My 3-year-old is beaming as he hands me a scribbled-on piece of paper with stickers of his favorite cheeky train engine embellishing it. Clearly these illustrations represent the creative genius that is our little guy, but so did the five other art pieces that came before it today. We’re running out of fridge space with this constant flow of artistic works, so we’ve got to be picky about which masterpieces we feature and where we put them. Sorry, trains in a cloud of crayon, but you aren’t making the cut today. To reduce the precious-artwork clutter, here are a few thoughtful ways to present the favorites and feel no shame when you toss the rest. 1. Weekly featured gallery. Can’t bring yourself to do a same-day throw-away? Have a designated spot on the fridge or the wall for rotating recent art. It will support your kids’ excitement for creating and give you time to zero in on the keepers before letting go of the rest. Grouping artwork on a piece of poster board streamlines the presentation for a cleaner look. It also allows you to group artwork by the individual child, so you can organize based on who did which project. 2. Sketch. Erase. Repeat. 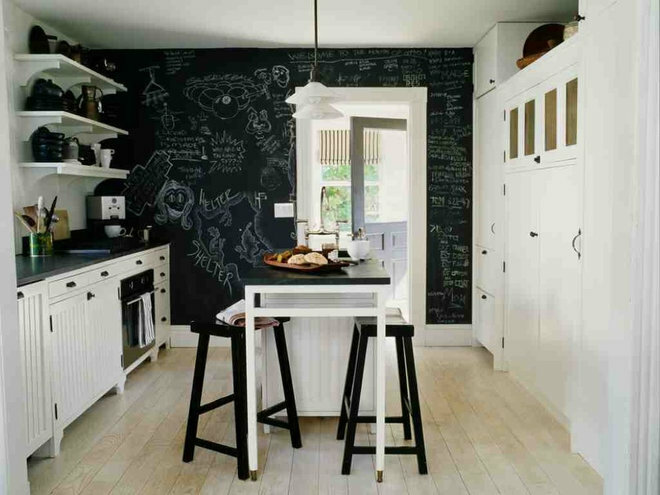 A chalkboard wall makes a bold statement and is a fun way to showcase the work of the little artists you live with. Since it’s a temporary display, it’s exciting to observe the creations as they grow and change. The wall will be a revolving door to what’s most important to them that day or week. Bonus: This doesn’t require much supervision or tons of craft supplies to get kids imaginatively creating. A chalkboard wall display is something the whole family can contribute to. Plan a family night when you all create, design and play together on the wall. It will be a fun memory, and the work of art will be even more sentimental, because it’s a snapshot of your family during the season you’re in. 3. Commission them. Kids are naturally artistic. That wonder, innocence and adventure give them an uninhibited ability to make things without expectations and boundaries. Haven’t you been to a modern art museum and overheard or maybe thought, “That looks like something my kid could do?” Well, OK, let them. Buy a canvas, then let them do what they do best with that childlike creativity. Let them explore. The result will be a priceless treasure. Once it’s complete, treat it like you would any work of art by framing and hanging it. 4. Time-tested. Mother-approved. Displaying kids’ art on a wire with clips is a simple and clean way to feature their talents. 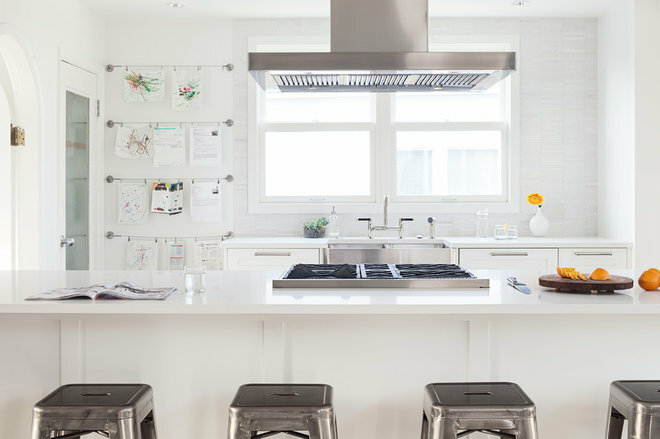 It’s a timeless look, and beautifully displays the art while reducing the clutter. The Dignitet wire curtain rod from Ikea is perfect for executing this display in a modern and crisp way. 5. Multipurpose art. A large roll of white paper and some paint can be used to make more than a poster for the wall. Let kids use it to make artistic coverings for notebooks or binders that your keep on your desk or bookshelf. 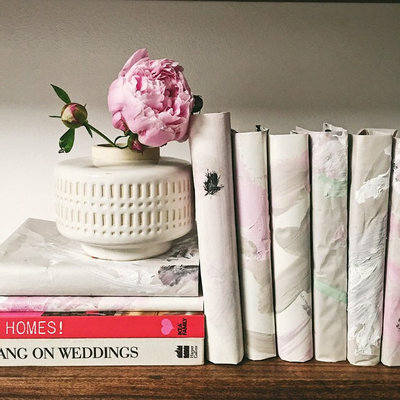 It’s a playful way to give your bookshelf some personality and show off their artwork in a practical way. Don’t be shy about providing direction for the colors that will be displayed on the spines of your books. Since you’re inviting the little ones to help with a decorating project in the home, it only makes sense that the colors complement the room’s aesthetic. Although the spine of every book will be colored or painted uniquely, the whole collection of books will look pulled together. Honestly, this is a great project even if you don’t have kids! 6. An element in a gallery wall. A gallery wall is an opportunity to show the depths of your style palette and a bit of your story. 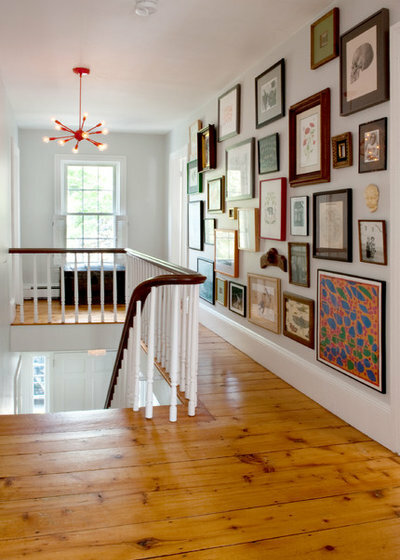 A curated art wall is personal, because it can contain anything from a piece discovered at the flea market to a photo of your great-grandma on her wedding day, to the splurge you made to remember that first trip abroad. Art from your little one is a precious addition in the mix of all these memories and treasures. 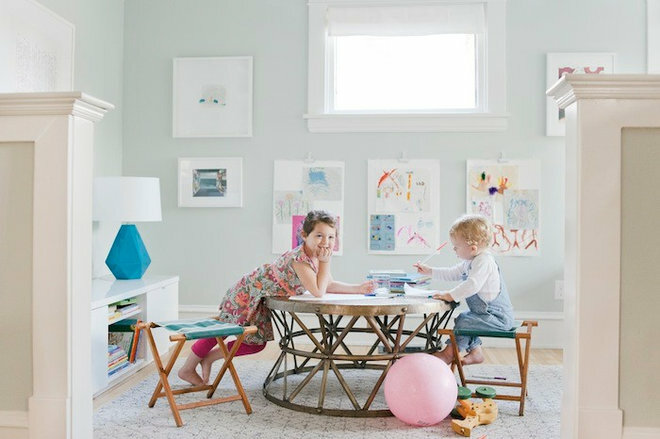 How to incorporate your child’s artwork into a gallery wall depends on your style. 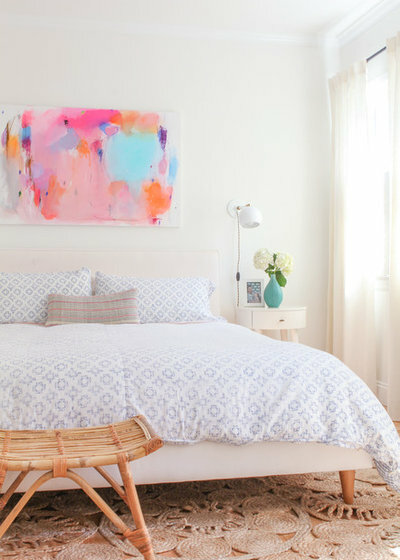 Selecting art in a similar color palette will create a cohesive and pulled-together look. For a gallery wall like the one shown, you’ll want varying sizes and orientations. Make a big statement about your kid’s creativity by making his or her work the larger, commanding piece that anchors the collection. Use one or multiple smaller pieces for variation on the wall. This personal touch will mean so much to you and your family. 7. Everything happens at the kitchen table. The kitchen table is the epicenter of so many of our most cherished moments in the house. Those four legs have supported hours of homework, never-ending board games, delicious and sometimes exhausting family meals, late-night talks and all of the coffee. It just makes sense to frame some of the artwork around the table as a signpost to what you cherish most. Select sleek matching frames and art in similar color palettes to keep the look fresh and warm. 8. Coffee table art book. When there is truly no more space for any more art, creating a coffee table book is a beautiful way to present your children’s creations when you’re ready to make room on the wall for new pieces. Scan the images into digital files and create a book on a site like Shutterfly. A book that is 12 by 12 inches or larger will feel like a true art book. Be sure to include dates and the age of your child on the cover, so when you look at the book years from now, you’ll know immediately what stage of life your little artist was in.